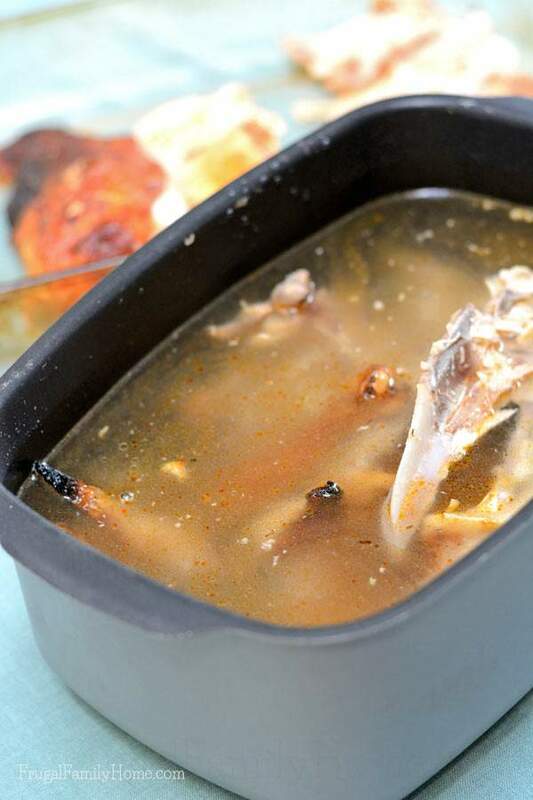 Whenever I purchase a whole chicken, I like to roast it and then use the bones and wing tips to make a nice homemade stock. Not only does it taste so much more flavorful than the store bought stock it also contains more gelatin in it which is supposed to be very good for you. Now, if you don’t want to roast a whole chicken you can always pick a rotisserie chicken from Costco. I’ve heard the price is very good and they taste great too. I’ve never tried one, but since I’ve heard these great reviews, I might be bringing one home with me soon. 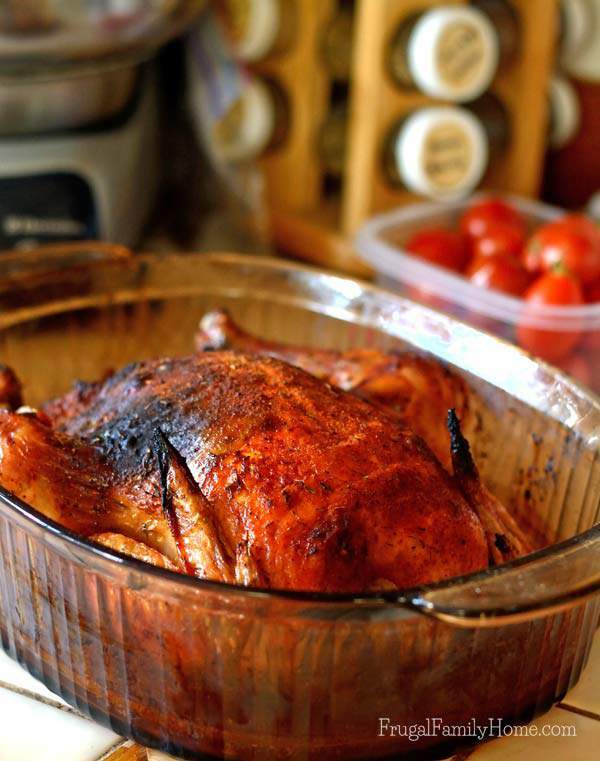 For this recipe I first started out by roasting a herb rubbed chicken. After it cooled a bit I took the meat off the bones. 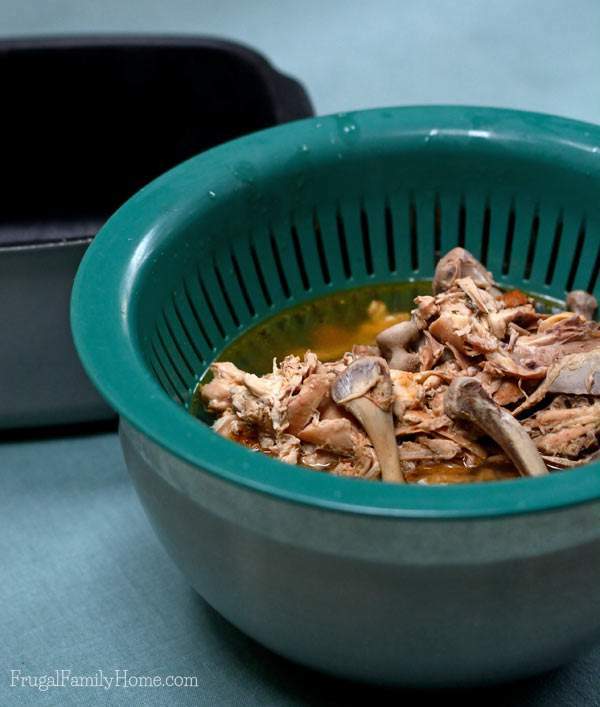 To make the broth, I place the chicken bones into my slow cooker and then cover with water. You can add in a cut up onion, a few carrots and a stalk of celery or two. I just added the bones for this batch since I had lots of seasoning on the chicken. I let my slow cooker cook overnight on low. Then in the morning I poured the yummy broth through a strainer into a large bowl. While the broth was cooling in the refrigerator. I took out all the little bits of chicken that were now off the bone and added it to a freezer container. To make a chicken soup kit. After the chicken broth and chicken were fully cooled I packaged the broth into freezer containers. I had enough leftover chicken bits from the bones and leftover chicken from dinner to make two chicken soup kits. 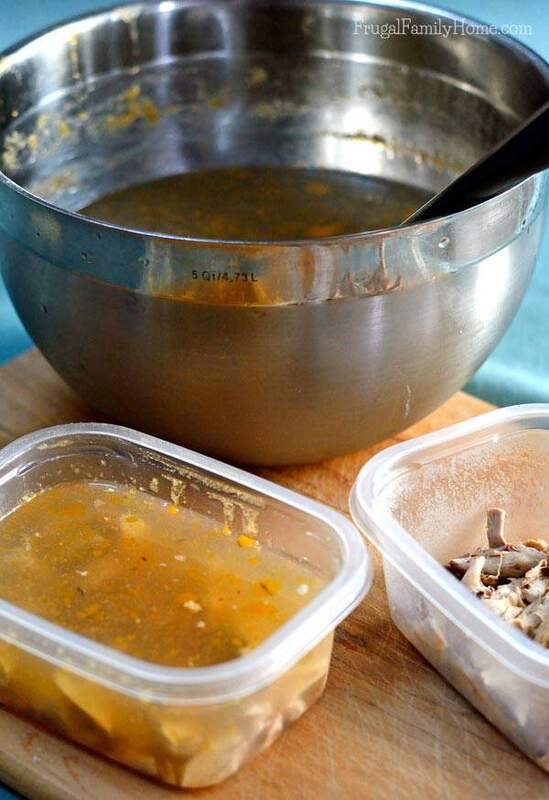 To make the chicken soup kits, you’ll want to place about a cup to two cups of chicken into a quart size freezer container. Then I add in enough broth to fill the container almost all the way full. Be sure to leave some space at the top as the broth will expand as it freezes. Then cover with a tight fitting lid and freeze. When I want to make soup, all I have to do is thaw the soup kit and add some vegetables and we have soup. I like to have quite a few of the soup kits on hand in the freezer for the winter. Out of the one $5 chicken, I was able to get two dinners, two chicken sandwiches, two chicken soup kits and three extra quarts of broth. Not too bad for one $5 chicken. Do you make your own bone stock? Do you usually use your slow cooker? Great post, Shelly. I’ve made my own chicken broth in the past, but nowadays, I always use vegetable broth in our meals. I’ve never made my own, but I’m hoping to someday. 🙂 I’m sure it would be much cheaper than purchasing it already made. 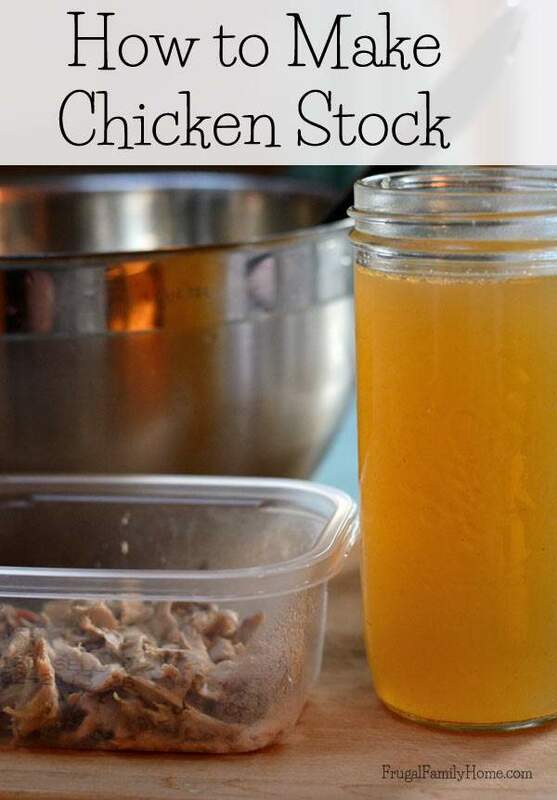 I always have the freezer stocked with homemade chicken and/or turkey stock – it just tastes SO much better and it’s so stinking easy! 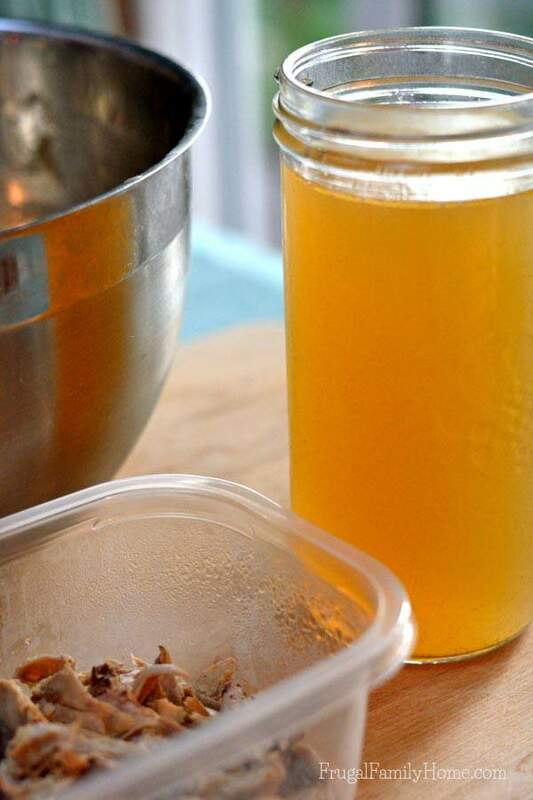 One tip I love is that you can freeze your poultry carcasses until you have time to make the stock or until you have enough – if you want to make a big batch of it. I was able to get a really large stockpot years and years ago and it works great for large amounts of stock! I put the carcasses into the hot water when still frozen and it works fine. Although I usually use fresh whole veg, you can also save your carrot tops, celery leaves and trimmings and onion trimmings in the freezer for making the stock with instead. I add a couple of bay leaves and about 12 whole black peppercorns to the simmering goodness as well. I might throw in some garlic cloves (pulled from the freezer) as well. I actually pressure canned a batch of stock a few months ago but my preferred method is to freeze in various sizes in zipocks. Or in ice cube trays or in my silicone muffin pans. I’ve made a spreadsheet of all my recipes and know which amounts I use the stock in and freeze in those amounts, i.e. 1 cup bags, 4 cup bags for making soups, etc. I just take the frozen stock out of the bags, thaw in a microwave safe bowl and add to recipes as needed. I believe whoever came up with the nickname of Liquid Gold for this stuff was SO right!